Earth Hour is the world’s largest grassroots movement that celebrates climate action, and it all began at a Hilton. In 2007, World Wildlife Fund (WWF) conceived of Earth Hour at the Hilton in Sydney, Australia. 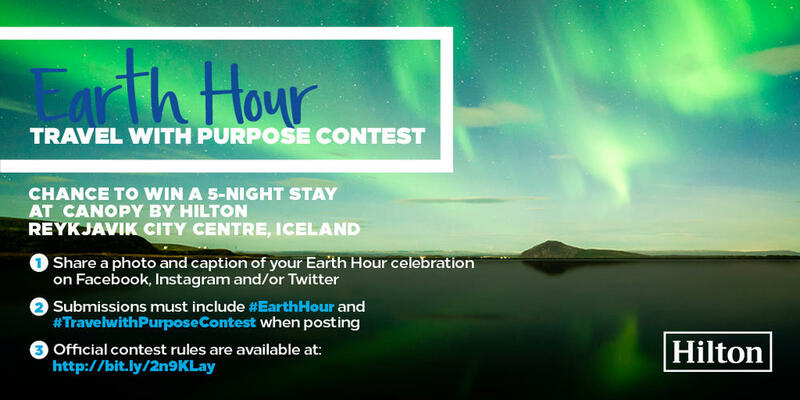 A decade later, Hilton is honoring its Earth Hour legacy with a global social media contest to spread the word on how we can all play a role in reducing our energy consumption. Earth Hour takes place this Saturday, March 25 from 8:30PM to 9:30PM your local time. Millions of people across the planet join the global Earth Hour movement by simply turning off the lights. Hilton is inviting you to take a picture of your Earth Hour “unplugging” and demonstrate your creativity in mobilizing climate action. Share your photo on Instagram, Facebook or Twitter using the hashtags #EarthHour and #TravelWithPurposeContest. The winner will win a five-night trip to see the world’s most famous natural light – the Northern Lights – in Reykjavik, Iceland! Since its inception, Earth Hour has inspired hundreds of thousands of Hilton Team Members at hotels around the world who have done everything from developing low carbon menus to hosting “dining in the dark” experiences and acoustic concerts. The annual celebration is part of a broader strategic partnership between Hilton and WWF that is focused on three critical areas: water use, sustainable seafood purchasing, and food waste. As a result of the collaboration and WWF’s insight and expertise, Hilton launched its Sustainable Seafood goals in 2016 and a new Water Stewardship Commitment just this week.